Gary Thor Wedow returns to Seattle Opera to conduct Orphée et Eurydice this season, after last season’s The Magic Flute—another opera about the supernatural power of music. A warm, inspiring presence on the podium who never lets his vast store of knowledge get in the way of communicating emotion musically, Wedow has led almost all of Seattle Opera’s recent excursions into 18th-century music, including Handel’s Giulio Cesare and Gluck’s Iphigénie en Tauride. 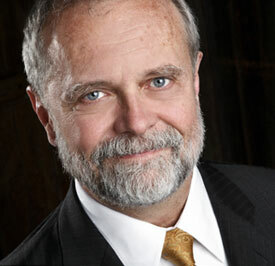 We spoke to him about the spooky voices our chorus will use while portraying demons on the path to hell, the brilliant high notes sung by our Orphée, William Burden, and what Orphée et Eurydice has to do with Valentine’s Day. First off, let’s talk about the actual notes in the score. How does modern pitch differ from what Gluck’s audience might have heard at the first Orphée et Eurydice in 1774? Pitch changed and was different in every century. Every town had its pitch, and lots of towns had church pitch, which was fixed because it had to agree with their organ. Then there was concert pitch, where the pitch could coordinate with the instruments in the concert. The pitch at the Paris Opera, where Orphée premiered, was much lower than most of Europe, but right after the premiere, the pitch started dramatically rising there. It was actually Goebbels, Hitler’s propaganda minister, who standardized European pitch in 1938. Previously, in the 19th century, Verdi had tried to legislate a slightly lower pitch. So it’s been a big discussion over the years. So how do you think this high pitch sits with William Burden, our Orphée? It sits beautifully with Bill’s voice. He’s a true high tenor, and his voice just glows up there. But that’s not the only component of this role. It’s famous for its high sections, but there are also low sections and there are huge dramatic recitatives that more or less take place in the range of spoken human voice. These composers tried to imitate famous actors of the day, and actors of the day sang their speeches more than they spoke them. “To BE! Or NOT to be!” You know, that sort of thing. Even David Garrick, who was famous for his naturalistic acting, performed in a much more declamatory fashion than we would ever expect an actor to do today. You know, when the head of the orchestra of the Comédie-Française got bored in the orchestra pit, when he wasn’t playing, he would notate the intonation of famous actresses’ speeches. And he saw that they never varied from their pitch centers. Once they learned a speech they didn’t vary; it was like learning a melody. Davinia Rodríguez (Eurydice) and Gary Thor Wedow, in rehearsals for Seattle Opera's upcoming production of Orphée et Eurydice. How much play do you usually get, as conductor, to ask your singers to disguise or color or otherwise transform the voice they’re using? Gluck felt that every passion that was expressed in the poetry could be expressed with a timbre or a color of the human voice. So that’s what we’re looking for, constantly shifting timbres—not a bel canto uniformity. For example, when the Furies are singing in hell, I’ve asked them to sing with hell voices, The Exorcist voices. The way their voice teachers hate. We have an exceptional cast of people who are not only wonderful singers but wonderful actors, so they’re very eager to find these different colors. That goes for the chorus, too? The chorus is really the star of Orphée. They are three different characters. They’re the nymphs and the shepherds who are friends of Orphée and Eurydice in the first scene, and then in the second scene we’re in hell and they’re the Furies. And even in that scene as they soften, the musical writing changes—they have to change from this hellish voice to the most beautiful plaintive singing, and then we go to Elysium, where everyone must sing beautifully. We’re doing this story with a male leading a female out of the underworld. But does the story make sense with other genders in those roles? Absolutely. There’s not a culture in the world that does not have a myth of someone going into the underworld to reclaim the person they love. It’s in all of our dreams. Anybody who has ever loved can imagine parting from their beloved. The story of Jesus Christ follows this pattern, going into the underworld and coming out again. In the Greek myth of Orpheus, Orpheus was a man, so this is the love of a man, a tender man, for a woman. It’s actually a little confused with Orpheus, because Orpheus was considered by many to be the prototype of the homosexual man. Earlier in his life he had been a lover of Apollo. Our version of Orpheus and Euridice has a happy ending, but in the traditional myth he comes back without Euridice and then rejects love of any kind; so the Bacchantes, women who worshipped Bacchus, are so infuriated by this rejection that they tear him limb from limb. 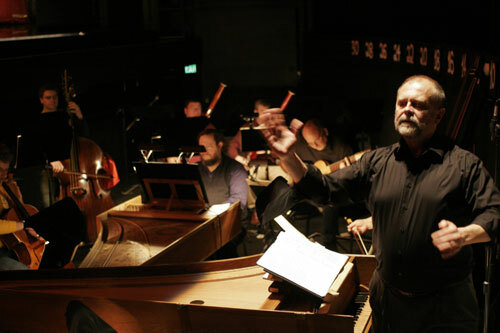 Gary Thor Wedow working with musicians in the pit for Seattle Opera's 2007 production of Giulio Cesare in Egitto. Why does Gluck’s version have this deus ex machina happy ending? It was the nature of the theater at that time, in 1774, the audiences demanded a happy ending. It’s like Hollywood in the ‘30s, all movies had to have happy endings. I’m conducting three different Orpheus operas this year; Gluck’s Orphée here, then in May I’m going home to New York to conduct Orpheus by Telemann, which is a very different version of the story. In that opera, Eurydice has a rival, kind of a mad queen who Orpheus works for, and she organizes it that Eurydice gets bit by the snake, thinking that Orpheus will then love her, which he doesn’t. And she then has him ripped to shreds in the end. So it’s a very different story! And then I’m doing a workshop at Queen’s College of Rossi’s Orfeo from 1647. So I’m immersed in Orpheus! Do you like the happy ending in our version? We have to accept that it was convention. But also, Cupid, that is Amour in this opera, says a very interesting thing. She says, “The virtue of your love, the very high quality of your love for Eurydice, has changed our mind. That’s why the gods are taking pity on you.” I can get behind that because I’m all for love. My favorite holiday is Valentine’s Day. I love it. Boy, if there were a lot more love in the world, we’d have a much better world. It’s what makes the world go round. For me, rather than looking at the way the myth really ended, the story here is that if love is good enough and pure enough, it can conquer anything. Even Greek mythology. Speight Jenkins writes in our Orphée program, “Gluck would spin in his grave to know they’re calling him a Baroque composer nowadays.” What do you think? You know the story about Gluck and Handel? Gluck adored Handel, and until his dying day he had Handel’s portrait in his bedroom. They met once, in London, and Gluck [the younger composer] showed Handel his music. What Handel supposedly said was “keep it simple,” and Gluck took that very much to heart. And then, Handel is supposed to have told people, “My cook knows more about counterpoint than Mr. Gluck!” Which maybe isn’t as bad as it sounds because Handel’s cook was actually a singer and a musician, and he really did know a lot about counterpoint. But I think Gluck, and Calzabigi, his librettist and director, and Noverre, their choreographer, they were very conscious of seeking a new kind of realism, what they called “a noble simplicity.” They were rejecting complicated counterpoint, complicated music, and attempting to try and get back to a kind of Greek simplicity, almost a primitivism. Art with a manifesto. That’s why I’m delighted we’re doing this the final version of this opera, because it’s a much better piece than the original version. But it’s not Baroque music. It kind of fits into the cracks. Neoclassism, if you want to call it that. But unfortunately what happened is, Gluck rejected Handel and had this tremendous success with this new kind of music; but then, who comes along next but Mozart, who wrote in a very complex way and was a master of counterpoint. So I feel kind of sorry for Gluck in a way, because his tremendous reforms only lasted for a minute. Handel was so popular until his death, and Bach—and then Gluck had this shining moment of glory, noble simplicity—and then Mozart came along with, as Emperor Joseph II said so famously, “too many notes.” But of course they are glorious notes.